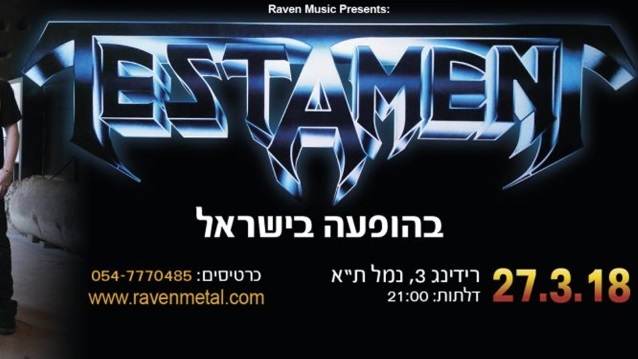 The veteran San Francisco Bay Area act played in Tel Aviv for the first time on March 27 as part of its ongoing world tour in support of TESTAMENT‘s 2016 album “Brotherhood Of The Snake”. As the band wrapped up the show, the musicians posed for a photo onstage holding the Israeli flag with the TESTAMENT logo superimposed at the top of it. Skolnick wrote: “Great night in Tel Aviv! First time, amazing crowd. Looking forward to next time! “I wish that were all that needs to be said. However… Unlike a couple of friendly bandmates of mine — thrown for a loop by the subsequent rage comments underneath pics of themselves posing with a team of young Israeli women in uniforms fulfilling their required service in the IDF — I’m anticipating blowback. “Now before you launch into accusations of my being a ‘supporter of the occupation,’ ‘Zionist sympathizer,’ etc… let’s look at a few things that are simultaneously true. * One can be a massive fan of PINK FLOYD‘s Roger Waters (I am), yet still consider his call for a ‘cultural boycott’ of Israel — and thus depriving its general population of music (which can be the best voice for change) — among the worst ideas you’ve ever heard. I do. (A pop artist who recently bowed to pressure from Waters — Lorde — canceled an Israel date yet went ahead with a concert in the Philippines on the same tour just after their leader, Duterte, committed a massacre of civilians there, highlighting the selectiveness of Waters and the BDS movement). * A flag can be both a symbol of a nation’s government and a symbol of that nation’s people. ‘The People’ includes those who oppose their own government (including the Likud party and Prime Minister Benjamin Netanyahu — whom I too oppose with a vengeance). However, all the people should not be judged by the worst transgressions of their own government (I’m not too keen on all the things done in the name of my country’s flag — preemptive war, Japanese internment, Indian displacement, slavery…I could go on…but it’s still my flag). TESTAMENT will support SLAYER on the first two legs of the Tom Araya-fronted outfit’s last-ever North American run of dates. Also scheduled appear on the bill are LAMB OF GOD, ANTHRAX and BEHEMOTH (with NAPALM DEATH replacing BEHEMOTH for the second leg).